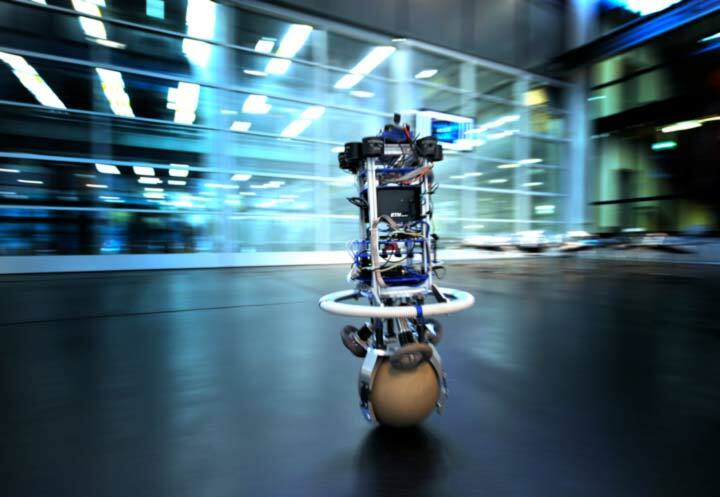 Designing robots that can function outside of controlled, factory environments isn’t easy. When those environments have people in them, they are especially unpredictable and difficult for a robot to navigate. Enter Rezero: a compact ballbot that can fluidly drive in any direction without prior orientation. Similar in size and shape to a human, Rezero can stabilize, instantly accelerate, avoid obstacles and turn around its own axis. It can also be programmed to follow a path, or a person at a constant distance, and it can even recover from jostles, making it ideal for navigating crowded environments like tradeshows, restaurants, offices and airports. Possible Rezero applications: personal mobile medical device, telepresence tour guide, personal transportation. It’s easy to imagine it one day being used to unobtrusively serve drinks at a cocktail event, as a personal mobile device for intravenous equipment at a hospital, or topped with a telepresence device and acting as a museum tour guide. Rezero could even one day rival the Segway as a personal transportation device. Like an inverted pendulum, Rezero (left) balances on a spherical ball; three omniwheels (right) transfer motor action to the ball below. Rezero’s agility comes from a propulsion and stabilization mechanism that keeps the device balanced on top of a single spherical wheel, like an inverted pendulum; it’s kept from falling over by constantly moving its contact point below its center of gravity. A sensor called an Inertial Measurement Unit (IMU) measures Rezero’s tilt angle, which is used by an onboard stabilizing controller to compute what kind of motor action is required to keep the system stable. Instructions are then sent to electric motors that actuate three special wheels (called omniwheels), which in turn transfer forces to the sphere below: forces are applied in the rolling direction, but allow for free motion in the lateral direction; opposing each wheel is an arrestor that keeps the ball tightly in place. This process of measuring, computing, and actuating happens 160 times per second, and the underlying controller is key to achieving robust and dynamic movement. Its ability to quickly respond to a changing environment is what makes Rezero so suitable for human environments, and according to Rezero’s creators, achieving this robustness was their most challenging task. Rezero’s controller is derived from a three-dimensional mathematical model of the system, and can combine complex and fluid movements around all axes. 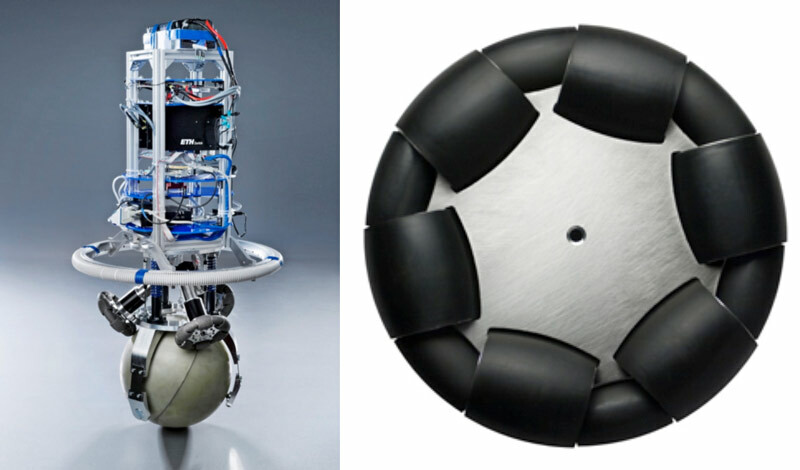 Compared to other ballbots, which can only lean a few degrees, Rezero can tilt up to 17 degrees as it leans into a curve at high speeds. But getting there wasn’t easy. Rezero was developed in 2009/2010 as an educational project at the Autonomous Systems Lab at ETH Zurich, and the 13 undergraduate students on the team were responsible for everything from concept to engineering, manufacturing and budgeting. Rezero continues to evolve even though some of the original team members have already graduated and moved on. The current team has just finished a new version of the omniwheel, which they have made available to other research groups. They are now working to improve Rezero’s robustness so that it can better manage obstacles in an everyday environment. Photo credits: Rezero in Motion (first photo): Karl-Heinz Hug, Ringier AG; Rezero in the Studio (third photo): Gerhard Born, Ringier AG. Note: This post is part of our Swiss Robots Series. If you’d like to submit a robot to this series, or to a series for another country, please get in touch at info[@]robohub.org.